My first thought was car fire. Then I passed two more burnt out old cars, windows bashed and coated in soot. Another on the other side of the block. Looking further down Church Street, I saw more scattered cars parked at odd angles, or crashed on the curb. No people. Only the sound of a few black garbage bags flapping at the base of a streetlight. A swollen bible on the sidewalk caught my eye. My next thought was haunted house. It was mid-October, and my next-door neighbor had been planting styrene headstones in her yard all week. Finally, I spotted the orange construction barrels blocking off Washington Road. Only then did I realize I had wandered onto a set. A security guard stepped out of a van and loped toward me. 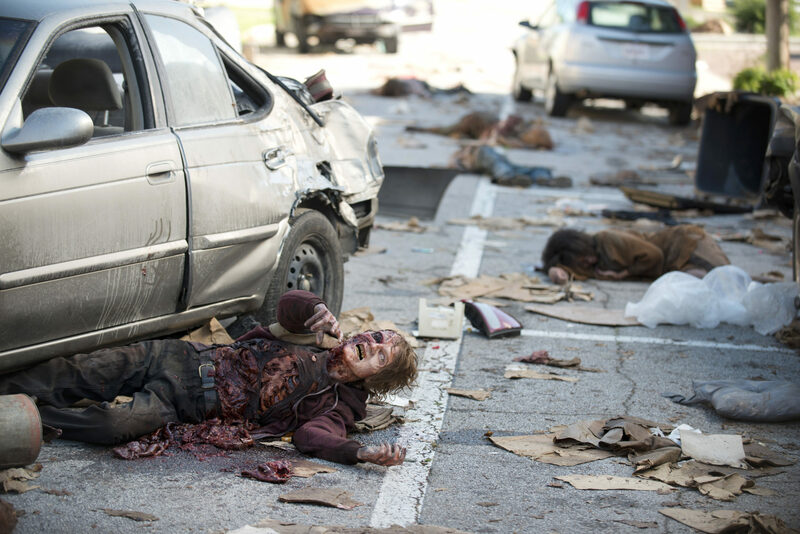 He confirmed that scenes for The Walking Dead would be shot there that weekend. Soon the whole world would be looking at my jogging path through downtown East Point. But almost as quickly as it started, the fizzy thrill of finding myself on a major television set was replaced by its inverse: a sense of creeping shame. What does it mean, I wondered, that East Point, with our condemned City Hall and half-vacant downtown, could efficiently substitute for an abandoned, post-apocalyptic zombiescape? Scene from The Walking Dead, Season 6 Episode 3. Photo by Gene Page © AMC. This made me rethink a few other particularly cinematic scenes of blight in my neighborhood. A used car lot, resplendent in knee-high weeds, seemed suspect. 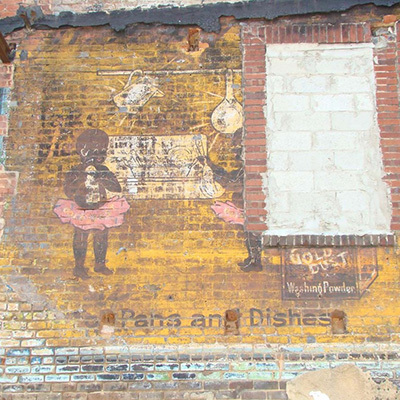 The small yellow office building centered in a crumbling parking lot had been tagged like a boxcar, practically swallowed by enormous graffiti bubble letters. Its spray-painted windows caught the morning sunrise, all brassy and bright. Was it part of a set, or just the usual decay? Right now there’s a lot of creepy stuff getting filmed on the southside of Atlanta. Suddenly, film studios have colonized the southside’s historic landmarks, from Lakewood Fairgrounds to Fort McPherson, even redeveloping dead malls and revitalizing historic town squares. Looking for that football stadium where your extras leap to their feet in that moment of triumph? Maybe you need a post-apocalyptic urban hardscape for that fight to the death? Or perhaps a vintage theater venue, rambling farm house, or neighborhood with charming bungalows . . . Such a description, and the current rash of filming on the southside, causes me to wonder: Why is the landscape of my youth providing the backdrop for horror/sci-fi hits like Stranger Things, The Walking Dead, and The Hunger Games? When Donald Trump tweets that my district is in “horrible shape and falling apart,” my mind jumps between these manufactured television sets, evidence of the southside’s economic resurgence broadcast nightly across the country, and the very real blight that drew in the cameras. Has the film industry discovered that the southside has been left behind to rot? Here in Georgia, qualifying productions can receive up to 30 percent in tax breaks by shooting here and dropping the logo – a cheerful, stylized peach – at the end of the credits. As a consequence, Georgia now hosts the world’s third-largest movie industry behind Los Angeles and the United Kingdom, and the film industry generates $6 billion in economic impact in the state. According to the Georgia Film, Music and Digital Entertainment Office, some 124 film and television projects were produced in the state in 2016, ranging far beyond The Walking Dead and encompassing everything from romantic comedies and Christmas specials to American Ninja Warrior and Pooh to the Rescue. But what are being recorded on the streets of my neighborhood are not typical romantic comedies or Hallmark dramas. While the area is represented as decrepit and desolate in the media, what Trump, and other outsiders fail to recognize is that the so-called inner city is teeming with life and culture. Miami Vice defined Miami. The Wire is all I know about Baltimore. Friends and Seinfeld formed my impression of a friendly New York City. TV shows create cities as much as cities create the industry. So what does the film industry tell the world about Atlanta? Until recently, not much. Most of the things filmed here are meant to invoke somewhere else – or nowhere recognizable at all. But the recent Golden Globe-winning FX series Atlanta is different. 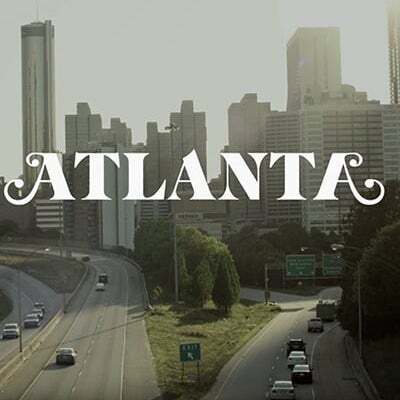 You see, I have always imagined that the southside of Atlanta was still truly “southern,” that the giant Coca-Cola sign on the Connector was a kind of boundary between the deep south and the upper Piedmont. Unlike Buckhead or Midtown, the southside still feels slow and soulful, quiet, despite the airplanes overhead, bass booming from cars, and gunfire at night. (L to R) Donald Glover, BRYAN TYREE HENRY, AND KEITH STANFIELD IN ATLANTA, Episode 1 “THE BIG BANG” © FX. This clicked when I was reading a New York Times obituary for the late southern photographer William Christenberry. His most iconic images were of his hometown in Alabama, a place “populated by dilapidated buildings, rusting automobiles, advertising signs, graves and vegetation growing out of control.” This vision of the haunted South was distinctly rural, yet it was also here, in the corners of my neighborhood. All kudzu-covered and rusted shut, it is where southern rot meets urban decay, at the intersection of gothic myths and lost causes. 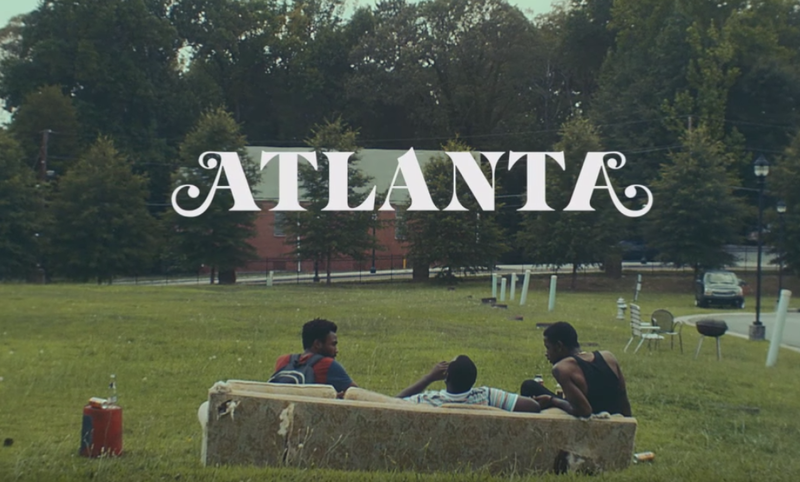 The aesthetic of FX’s Atlanta, which is not creepy, but rather magical realism, is intentional and even reverent about capturing that crumbly, rusty, often surprisingly rural underside of the urban landscape, even if just to give you whiplash when a scene cuts to the shiny interior of the airport, a club, or a restaurant. It feels like a time capsule, a repository for a rapidly changing city. Donald Glover’s Atlanta shows the world the distinctly southside feel of a convenience store parking lot or a MARTA bus rocking a child to sleep. 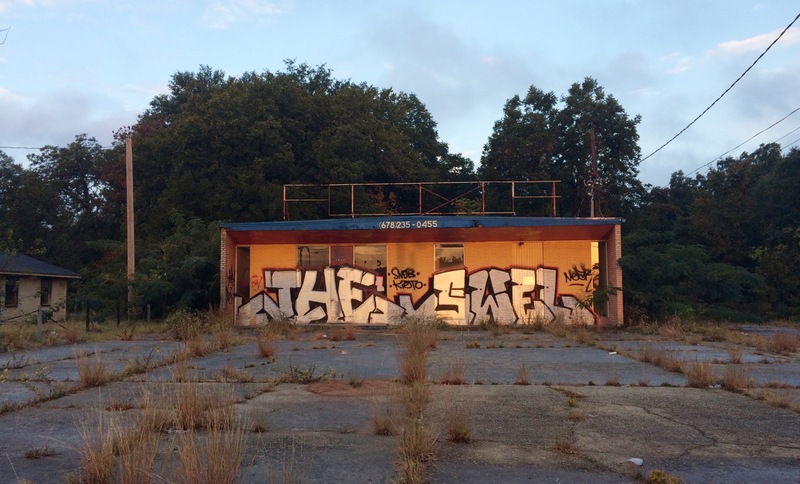 It captures the haunted nature of a modern urban southern city, and particularly the conditions of urban blight on the southside, in a way that is both elegant and unsettling, and ultimately more durable than the more sensationalized dystopia of The Walking Dead.